Patterned after the Bible that eighteenth-century preacher and theologian Jonathan Edwards used to record more than 5,000 notes about God's Word, the ESV Journaling Bible, Interleaved Edition includes a full, blank page next to every page of Bible text. Created for Bible readers looking for as much space as possible for sermon notes, personal reflections, prayers, or artwork, this edition is destined to set a new standard when it comes to innovative Bible design focused on consumer needs. ESV Journaling Bible, Interleaved Edition (TruTone, Black) by English Standard was published by Crossway in July 2016 and is our 5228th best seller. The ISBN for ESV Journaling Bible, Interleaved Edition (TruTone, Black) is 9781433553349. 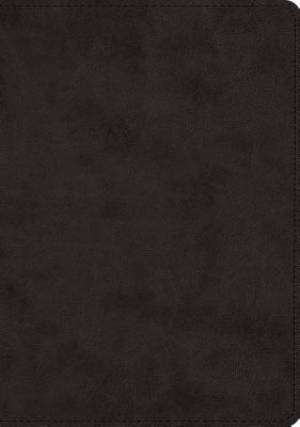 Be the first to review ESV Journaling Bible, Interleaved Edition (TruTone, Black)! Got a question? No problem! Just click here to ask us about ESV Journaling Bible, Interleaved Edition (TruTone, Black). Hi, I just wanted to know if the cover was fabric over board or imitation leather before I buy it. Thanks. A:This Bible's cover is imitation leather. Thank you for using the Q&A Forum.